We are often asked about living aboard a boat full time. This is a common discussion for us, given the temperate climate and beautiful setting of lakes in the Houseboat Capital Region such as Norris Lake. Below are some frequently asked questions about living aboard a boat. Can I qualify for a houseboat loan if I have bad credit? While houseboats are generally less expensive than houses, they are considered to be luxury item by most lenders. If you can’t qualify for a loan on a traditional home, chances are that you will have difficulty securing financing for a houseboat. What features should I look for when choosing a boat to live aboard? One of the most important features that you will want to look for on a live aboard boat is insulation. You will also want to find a boat that has optimal storage space so that you will have plenty of room for your belongings. Remember that houseboats often have built-in beds, dressers, etc, and you will not be able to move most of your home furniture onto a boat. You may also want to find a marina that operates year-round. Many marinas shut off their water supply to the slips for the winter, in which case you would have to rely on your holding tanks for water to last through the winter. What do I do in the winter if the marina shuts off the water supply? Although you will probably have fairly large holding tanks on your boat, they are unlikely to last through the winter, especially if you are running a dishwasher and using a washing machine (not to mention showering, as the cold weather may make lake baths rather uncomfortable!!). If your marina does turn off the water, you may want to consider installing a lake water pump. This pump draws in lake water and can be run through a mini-sanitation system that will make the water safe for dishwashing, showering, laundry, handwashing, etc. You will want to use bottled water for drinking and cooking, however. A lake water pump is a much more convenient alternative to taking you boat to an operational marina once a week to fill up your fresh water tanks. Can I have my mail delivered to a marina? Some marinas have a mail sort and you will pick up your mail at the marina office or at a mailbox designated for your boat. 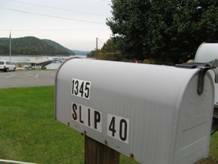 If your marina does not have mail delivery, you can always use a Post Office box. How much storage is on a houseboat? Will I be able to keep all of my belongings? Storage space is definitely limited on a houseboat. Even a large boat will not compare to a small home in the amount of storage and closet space. There is usually under boat hull storage, small closets in each bedroom, and possibly a storage locker on the back of the boat. As mentioned above, boats may have built in beds, dressers, and closets and you will not be able to move most of your current household furniture onto a boat. Most boats also come furnished so you would not need your living room or dining room furniture either. You will most likely have room for some clothing, kitchen items, toiletries, and a few personal belongings. I know I will have a monthly loan payment, but what other costs do I need to consider when planning to live on a boat? Many people see boat living as a cheap alternative to buying a house. The truth is that there are just as many expenses, they are just allocated to different things. For example, you won’t have a mortgage, but you will have a boat payment and slip fees. Slip fees can range from $250-$500+ dollars a month (in our area), depending on the lake and marina. You will also have to pay for pump out, utilities, and insurance. If you plan to use your houseboat as a boat or have to run your generator, you will also have to consider fuel costs. What if my boat is on a buoy line? Will I have access to my boat year-round? Some marinas that operate year round may be able to transport you to your boat. However, you will be restricted to their hours of operation. More than likely, you will need to have another boat in a slip on a catwalk that you can use to ferry back and forth to your boat at your convenience. Will I still be required to pay property tax if I am living on a houseboat? This depends on the location of your boat. In Tennessee, there is no property tax on boats. However, there is sales tax. In Kentucky, there is property tax but no sales tax on used boats. You can use a boat as a second home and write off the interest as long as there are separate sleeping quarters, a cooking surface area, and a head. Are live-aboards allowed at all marinas and on all lakes? Rules for full time live aboards can vary by location. Check with you local authorities or ask your local marina. They will be most familiar with the rules and regulations for your area. I’m not sure if I will really like living on a boat. How can I get a feel for what it will be like to live on a boat? The best way to get a feel for boat life without purchasing a boat is to rent. Most marinas offer houseboat rentals by the week or for a weekend. But do remember that what is fun for a week may not be fun for a lifetime. Do your research and enlist the help of a qualified broker in finding a boat that will work for you. YourNewBoat.com is a corporate member in good standing with The Yacht Brokers Association of America (YBAA).